Smart weapon can be defined as a guided munition equipped with a laser, television, or satellite guidance system intended to precisely hit a specific target, and to minimize collateral damage. Such weapons use guidance systems that rely on external assistance, are distinguished from brilliant weapons, which are totally self-guided. Globally, changing warfare tactics and rising need for precision munitions are expected to remain the key growth drivers for the smart weapons during the period of study. Geographically, North America dominated the smart weapon market driven by higher defense budget and high spending on up gradation of its weapons technology. North America was followed by Europe and Asia-Pacific as second and third largest market for the smart weapon market. Asia Pacific is projected to have the fastest growth due to increasing defense budget of major economies like India and China to protect its borders from terrorism and intrusion activities in the region. This report identifies the smart weapon market size for the years 2014-2016, and forecast of the same till the year 2022. 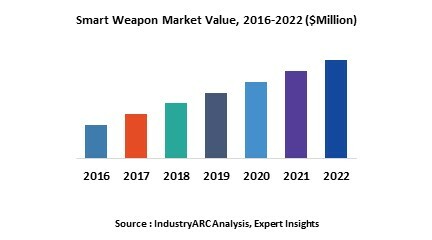 It also highlights the market drivers, restraints, growth indicators, challenges, and other key aspects with respect to the smart weapon market. 11.8. L-3 Communications Holdings, Inc.